The process of perfecting a recipe is largely trial and error. It requires understanding the basic ingredients (coconut flour, what have I done to you?) and the variations for different situations (i.e., coconut flour needs more liquid and eggs than other flours), then tasting them against one’s experience in actual use. Make, taste, smell, notice, change, repeat. This is my mantra when it comes to perfecting recipes. Still, perfecting any recipe is a challenge for me. I am, shall we say, a little obsessive with my testing. 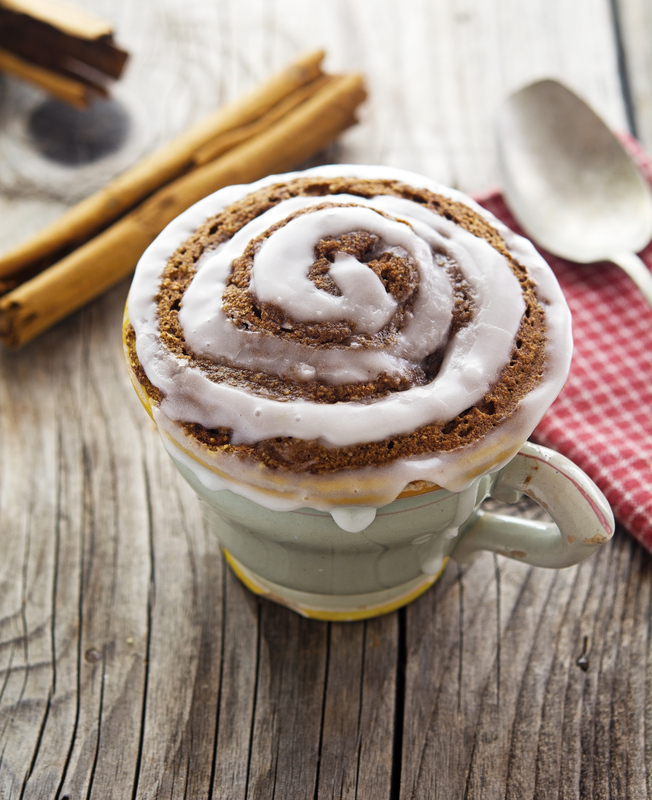 When there are a lot variables (temperature, time, sweetener, spices, wet ingredients), but also a huge built-in expectations (cinnamon rolls are serious business, there’s no room for error), it’s an even bigger project. What normally takes me a few days of testing ended up taking me over two weeks and several dozen individual tests to finally hit the mark. 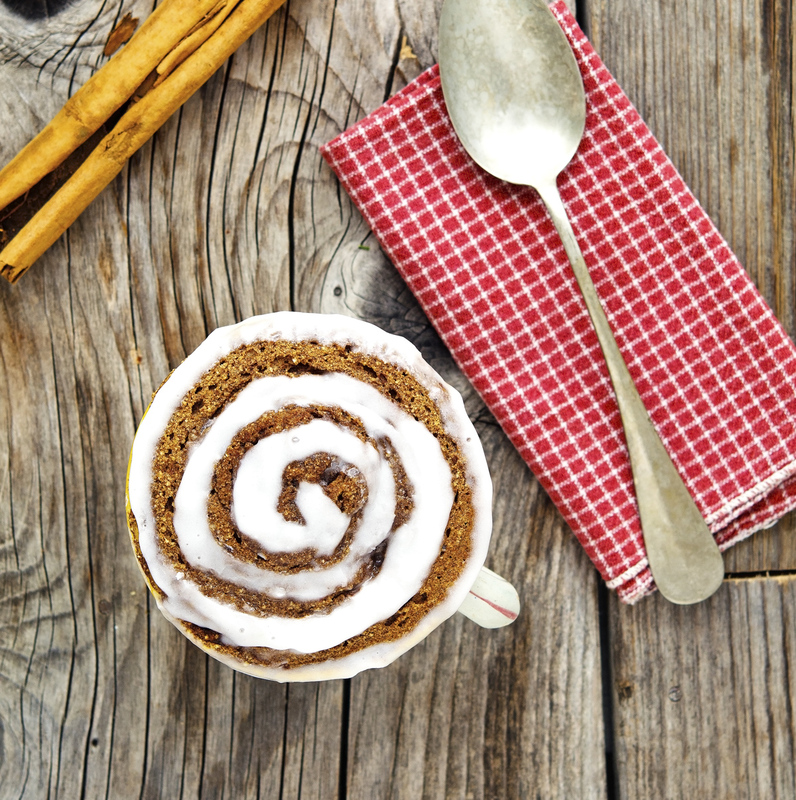 So I’m not kidding when I say that I’ve made this this (Paleo) Cinnamon Roll in a Mug at least 25 times. The first attempts came out too dry and cakey or just sunk into a stodgy, unpalatable mess. They tasted nothing like what they were supposed to (at least in my mind). Others came out too runny and fudgy. I still ate them as I hate wasting food. But then, then it came out exactly as I wanted to: cakey but not too cakey, moist but not to moist, sweet but not too sweet, cinnamony but not too cinnamony. All in all: just perfect. When you feel like having a cinnamon roll, but want it to be gluten-free, paleo, and vegan then this is for you. In just 2 minutes you can have a delicious (Paleo) Cinnamon Roll In A Mug, and believe me when I say: it’s LEGIT. 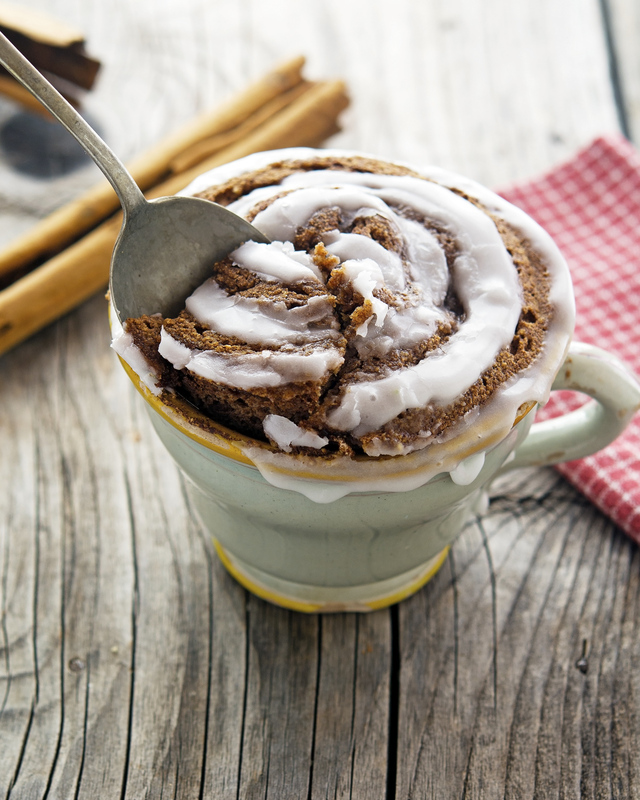 (Paleo) Cinnamon Roll In A Mug Print this recipe! Mix all cinnamon roll ingredients in mug, adding the baking powder last. In the meantime mix all the icing ingredients in a small bowl. 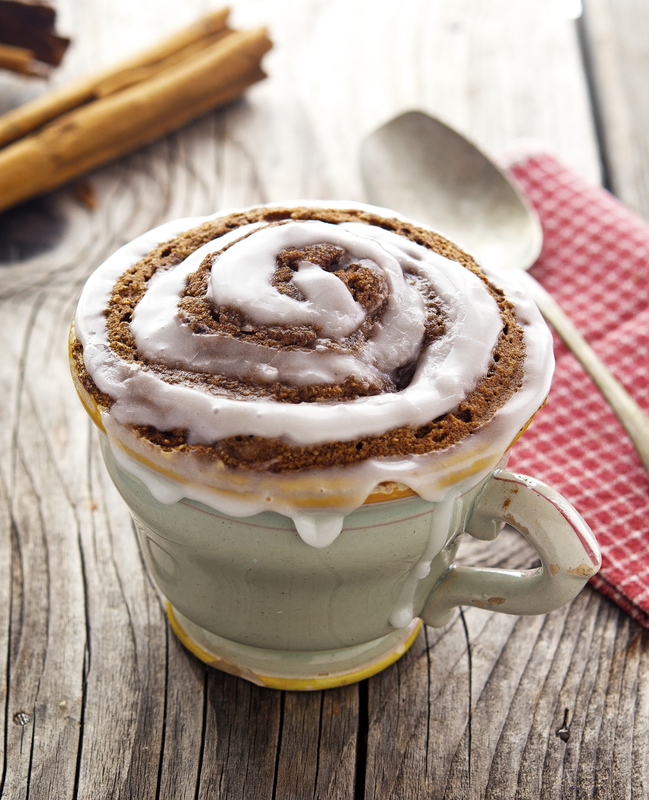 Drizzle icing over hot cinnamon roll. One serving yields 452 calories, 30 grams of fat, 39 grams of carbs, and 9 grams protein. Mike - you took mug cakes to a whole other level! Thanks for perfecting this recipe - it sure is a beaut - right down to the coconut butter/milk icing! Definitely awesmazing, my friend! Thank you so much S! This is the second mug cake recipe I saw today and I'm thinking it's a sign I should make one soon. I wish I could've had this cinnamon roll for breakfast! It is a sign Bianca, go make one now! If you do, please report back! I'm impressed with your determination, Mike! I would have given up after the second attempt! And look at this gorgeous cinnamon roll! Never ever has been the recipe so simple yet! Thanks for sharing this story. At least now we know how much strenuous work (and how many carbs were consumed) did it take while developing this 'simple' recipe. Hi Mike, just glancing at the title I first thought, I bet he made a cinnamon roll out of cauliflower, but now I know better. I have never baked with coconut flour before, wondering if it tastes coconutty? This looks amazing!!! I will be trying this for sure. Can't wait to try this. Have been trying to develop a sticky date pudding in a mug - not quite there yet so may reach 25 times too! I hope you do get there because sticky date pudding in a mug sounds phenomenal! Mike this is genius! I have been stuck in a rut and make chocolate mug cakes over and over again! Now I know what I will be making when I need a mug cake! Genius! Everytime I visit Mike - you give me such great ideas! 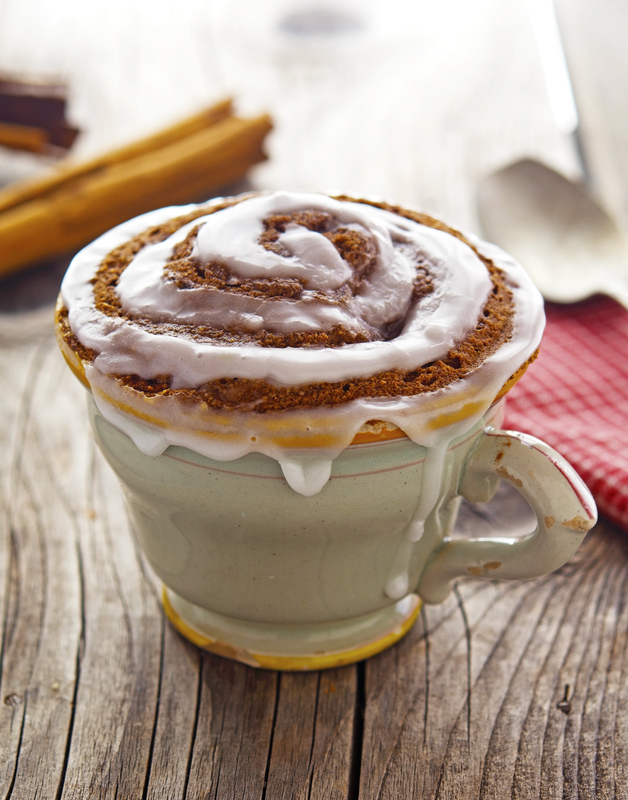 This cinnamon roll mug cake is an exceptional idea. Holy heck this looks amazing. We are really reaping the benefits of your impressive trials! I came here from Foodgawker because you have labeled it as vegan, but unfortunately it's not because it uses egg. Can you recommend a way to make it without the egg? Hey Mike-- been following for a while since my son with allergies had to go paleo, but I've never commented before. HAD to let you know that you did indeed nail this one. Happy Dance. We made them for breakfast this morning and the one mug holds a person for 4 hours. The 14 year old gives you the big thumbs up, and 14 year olds don't like ANYthing so that is high praise. Thanks so much for the testing ad nauseum! Thank you so much, you've just made my day. Fist bump to 14-year old for liking my recipe! Thank you for a reply from someone who has made this already. It is so useful to hear your results and comments! I definitely want to try this!! I miss cinnamon rolls after my celiac diagnosis. I bought my first bag of coconut flour from Whole Foods two weeks ago and have YET to try something. This shall be the first. YAY. now I have a quick question - do you think the roll would still be ok without the icing? I know I am part of a minority but usually when I make cinnamon rolls I leave mine without icing, I like the texture and taste of the roll itself without extras. have you tasted it without? Sally, I'm sure you've tried this since posting but just wanted to reply and say I just made this tonight sans icing and it was AWESOME. I also like my cinnamon rolls without extras (sometimes just too sweet with!) but am a serious Cinnamon Roll lover - and I was SUPER happy with this without any frosting. by the way, made your paleo=moussaka.... AWESOME! shall be on the blog sometime.... the topping with cauliflower was unreal! So much lighter than bechamel... I am sold! This is just stunning! To be able to make something healthy that looks that good ain't easy but you nailed it. Just goes to show that perseverance pays off! Even if you have to suffer through all of your fails, lol. so after living without a microwave for several years and watching mug cakes popping up in this blogoworld from the sidelines, i've recently moved back into a house complete with microwave. your mug cake may have just won the award of my first ever. this looks amazing! I just about died when I saw this Mike, arrgh looks so good, worth all the tries I'm sure! Do you mind if I include a link and image in a fall inspiration roundup post I'm doing? OMG, I can't wait to try this! I'm so glad you did all the recipe testing (that's some serious dedication). I really hesitate to get the coconut flour out anymore because I haven't had much luck with it (it always takes so many tries to get it right)! I'm pretty much always craving cinnamon rolls so I can't wait to try this one! Love your recipes! Would we still be able to use this recipe without a microwave oven? This sounds amazing! So any advice on how to make this without a microwave (yup, I'm one of those that don't own one)? Try 350 for 10-15 mins. Haven't done it but I saw a very similar recipe and they had an option like that. Any results on the oven method? Or, Mike, do you have a recommendation? This recipe looks great! Thanks for your dedication! I made it this morning it was a success and delicious. The only thing I didn't have coconut butter and used grass fed butter nevertheless it still tasted great. Thanks for sharing this recipe! Hi Mike: I enjoyed the flavor. I'd think I'd like it better with more chew. I think I'll try adding oat flour. Thank you for your yummy work. Looks, sounds delicious but Mike....30 gms of fat?!!! Not sure it's all that healthy. I'll eat it if it takes me to iron man (woman) status, though!! Just found your website...I'll be a regular visitor for sure!! is it possible to bake and not microwave? Oh my! This is seriously so good! I don't leave comments often but felt like I had to after sitting in cinnamon roll cloud 9! I'll be dreaming of it until I make it again! Didn't have the coconut flour, so subbed almond flour. Didn't even need the icing. Cinnamon is my favorite flavor of all I eat it every morning. Now I have a protein option. The empty cup is sitting beside me and my mouth and tummy are so satisfied. Thanks! I tried this with my whole family and we discovered using the flax egg made it waaay to mushy, but the egg made it too dry and totally absorbed the glaze or anything you put on top of it resulting in a way too sweet cake you don't want. So we made it using one egg AND one flax egg for perfect moist texture, but having to microwave it for 2 minutes and 35 seconds. THAT was the perfect combo, but I think it's too sweet to feed one person, serving size should only be half. I feel the urge to treat myself this weekend all of a sudden. Lovely post Mike will let you know what mine turns out like! Okay, so normally I have zero luck with paleo recipes turning out like they are supposed to turn out and, being an impatient person, if they don't turn out the first time, I throw out the recipe. But I was desperate for a quick cinnamon bun-style fixed so I made this recipe. Well, it turned out beautifully the first time, so I followed it up with a second mug for my husband - it also turned out. I even experimented with cutting it into 4 and frying it a bit for a crisp texture on the outside - that is a prelude to using it for my next experiment - cinnamon bun french toast - one of my fave breakfasts. Thanks for the recipe! Could another flour be subbed for coconut flour? We have coconut and almond allergies in the family. Que buena pinta! !, me lo apunto sin dudarlo, un saludo desde España!! I wanted to tell you that I did make this and it was really really good! I thought I had been doing so well on my diet...lost 15 pounds and went gluten/wheat free. Went to the doc last week and my cholesterol (which was already high) went up 50 points and so did my LDL. Doc was not happy so we started going through everything and she told me no more coconut oil or butter. What?? Now what I am going to make all my healthy Paleo foods with?? I am soooo bummed I don't know what to do. Just made these for breakfast and YUM! Will be making these again, thank you so much for sharing!! This is my new fav recipe! Oh my goodness! This was absolutely amazing. I am having a horrible day (and my one year old has decided she is too) and it is rainy and perfect day to try this recipe that I stumbled across last night. Wow! I will admit that I was skeptical. Cinnamon rolls used to be a favorite comfort food but after going paleo and figuring out I had food sensitivities I never thought I would eat another yummy roll of goodness without feeling like crap afterwards and usually feeling disappointed that it just didn't live up to the memories in my head. I am scared of my microwave because it has a mind of its own. I mixed the ingredients, pooped it in and stood back waiting for an explosion. It didn't happen so yay! Made the icing, spooned it over it and dove in. Amazing to the last bite! My one year old decided she needed cuddle time and comfort food as well so we shared. My mouth and belly are satisfied. Thank you so much! OMG Becca, that's so awesome. I'm stoked you (and your daughter) enjoyed that much. You should definitely try my other mug cakes, they're just as delish! Made this for breakfast today - perfect texture! I think a tsp of cinnamon was a bit much though. But i tend to buy the fancy expensive kind because i love cinnamon so much, so that's probably it. Great recipe!! I was sceptical at first, but my God, this was AMAZING. Used soy flour instead but came out perfect! This is the BEST paleo mug cake recipe I've ever tried!!! Thank you for your time and effort yo make it so! Hi Mike, I am here for the first time. Your recipes are fantastic. The cinnamon rolls look very tasty. I just tried your recipe last night. I didn't have any coconut butter on hand, so I omitted the icing, but it was still so good! I've tried many versions of paleo mug cakes, and I've been sadly disappointed because they are usually small and more like a sweet omelette. This one actually rose well and filled an entire ramekin, and actually had a cake-like texture. I can't wait to try it with the icing! "Cap'n, we're gonna need a bigger mug!" was running thru my mind as my cake started to escape from the container like a clam exiting it's shell....as the timer went off, I grabbed the mug, flipped the pseudopod back in, and all was well. And yummy. I hate to make changes to a recipe on the first try, but I went with what I had. Honey, no maple syrup...margarine instead of coconut oil...and gluten free flour from MySpiceSage. I'm neither Paleo nor gluten free, but make treats for my daughter and son-in-law who are truly gluten intolerant, not just "faddies". A sprinkle of confectioner's sugar made it just sweet enough. The longer it cools, the better it tastes. The calorie count is the only thing keeping me from making another one for later today. Thanks so much for the recipe. Now I will try your cauliflower pizza crust for dinner. Wow, i've now made this recipe twice and obsessed although admittedly I've gone a bit naughty with the icing. My sweet tooth took over and made my icing with a bit of powdered sugar and a wee bit of almond milk. Fantastic! How would I cook this in the oven? I do not own a microwave? What a delightful treat!! I made this for the first time today and it's now going to be my favorite indulgence. Thanks for all your hard work creating this recipe! Just saw the recipe in pinterest cause I was craving something sweet. It's the best mug cake that I ever tried. It turned so well and soft. I changed it a little bit cause I didn't have all the products - I used corn flour, honey and stevia also just normal milk, because I'm on a sugar and gluten free "diet" from 8 months now. However will do it again, soo good! Does this really have 39 grams of CARBS?????? 39 grams of carbs? Say it isn't so. I made this today for breakfast and it was tasty. I used 2 flax eggs and I had to microwave it for over 5 minutes and it was still a bit runny. My frosting was a bit darker than traditional cinnamon roll frosting because of the coconut sugar, but it was still good. I will be making this again and doing my own recipe testing. :) Has anyone else made this with 2 flax eggs and had it turn out? I will try it with one flax egg. Thanks for the lovely recipe! I don't use a microwave. Can this be made in the oven but still in a cup? I love the cup idea! Yum! I didn't have nutmeg, and I subbed 1tsp Truvia, skipped the icing, and it was still very good! Didn't have maple syrup so I used black strap molasses..it was quite yummy. My icing needs work though. So, I scrolled the reviews...any chance this could be made for more than 1, like for a family of 5? Thoughts...would love them!! Regarding your icing recipe - coconut butter and milk of choice - is there a recommended why to incorporate these two items together to yield something I can drizzle? All the coconut butters I've found are solid.